In the ever growing compact SUV market the Q3 manages to more then hold its own. A recent facelift in 2015 further improved the quality of both driving experience and comfort. The Q3 has an option of 2 or 4-wheel drive. All engines also underwent an upgrade further improving fuel running costs and emissions. Diesel and petrol engines are an option with a 2 Litre TDI version is also available that can output 18bbhp, not bad for a compact SUV. All engines can have either automatic or manual with a 6 speed gearbox. Three trim levels are on offer, from the entry level yet still high quality SE to the sporty S Line Plus. Sharp handling makes this compact SUV a joy to drive especially if the dampers upgrade is chosen. The RS Q3 delivers 335bhp and a 0-62 speed of an amazing 4.8 seconds. Sports car figures indeed. If you’re after ultra-economical running costs the 148bhp 2 Litre version is your best choice with up to 61 mpg. 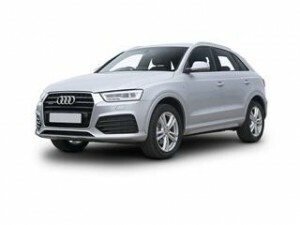 As you would expect for an Audi prices for their class are competitive however we could still save you money on a new Q3. Our real time quote service allows you to choose and build your ideal Audi then see a reduced price, simply continue to receive further information on the price.